This was a momentous occasion in the lives of all the senior kindergarten children. Looking smart in their crisp, new graduation robes and caps, the graduating students had look of confidence and pride. Seeing the big smiles on their faces on the morning of their graduation was fantastic. 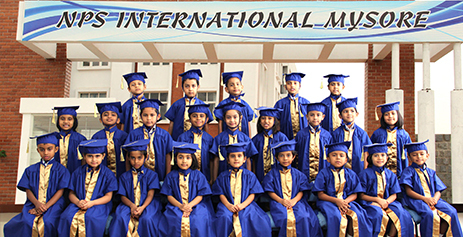 Graduation day was indeed a day to treasure as our little ones looked ready to take on the new challenges they would face in pre-primary. The ceremony started with a welcome speech followed by an invocation song by the Montessori children. The Principal Ms. Shubha Achaiah handed over the certificates to the young graduates. This was followed by a graduation song and speeches by the graduating children. The young graduates were entertained by a dance number followed by a farewell song by the Montessori and kindergarten children. Looking ahead, our confident kindergarteners are very well-equipped to take on the next part of their school lives. They have a strong foundation and we feel very confident that we have given the children a great start in life. We wish them all the best! Vikram Perfect conducted a Dental Check-up camp for the students of grade 1 to 8 on 27th, 28th and 29th August. Dr Anita Nitin, Cosmetic and Laser Dentist at Vikram Perfect did a presentation on Oral Hygiene. Dr Pragnya, Dental Surgeon at Vikram Perfect did the dental check-up for all the students after the presentation. The presentation and the dental check-up were informative and motivated the students to maintain good oral health. 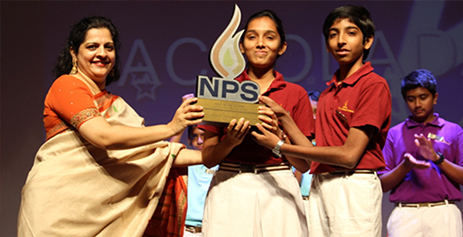 7th March 2014 was the ‘ACCOLADAY’ at NPSI. A day that we will celebrate at the end of every yearto acknowledge and recognize all the achievements and hard work put in by the students. “Achievement is not about being the best, it is being better than you were yesterday!”. So it was a day for all of them, for having marched ahead, and having progressed in various different ways this year. Some of them have enjoyed public recognition outside for their success; some have won many appreciation certificates in class, some have represented NPSI on the sports field, some have sung with the choir & taken centre stage at the various class assemblies, some may have tried hard to improve their work and some may have been a loyal and kind friend. All these successes make up the tapestry of student life at NPSI Mysore and we truly appreciate all of them. Individual competitions were held at the primary level under various categories. We had about 10- 15 competitions for this group. Grade 6 and above competed at the inter-house level, where we had about 32 competitions including sports. Challengers House won the Best House Trophy for 2013-14. Certificates and Star badges were given to all the winners. Being able to make money is a talent that will serve children well when they grow up. It is with this belief that the school nurtures the entrepreneurial skills amongst its students with its unique YEP, Young Entrepreneurship program. These creative thinkers are encouraged to use their natural talents and come up with ideas of products to make and sell. They are involved totally from the designing of their products, costing, sourcing of raw materials, production and the final marketing which culminates with a special market day is organized and parents are invited to come and support this entrepreneurial mindset of these youngsters. February 22 saw the Market day of the first batch of our business brains. 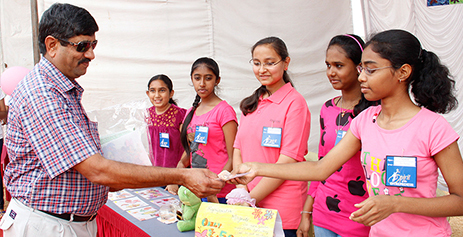 The day was marked with colourful stalls put up by the 6,7 and 8th graders with the help of their teachers. The invite for the day itself was a very inspired tiny paper shopping bag with a currency note pass. Their ventures included personalized, handmade, decorated keychains, gift bags, shopping bags, fridge magnets, coffee mugs, pen holders, paper folders, decorated plant holders, jewellery, rangolis, paintings etc. Quite a visual treat! Then of course to indulge the taste buds were stalls that offered sandwiches, bread chats, churmuries, watermelon chat, lemonade etc. All the items crafted/ cooked were completely sold out indicating the absolute success of the day. Yes, the support of the parents in being such big hearted, benevolent buyers is truly appreciated!! . Aujourd'hui, les étudiants de NPS international Mysore ont célébré la Journée Française. Ils ont commencé avec une prière courte et douce, suivie par les nouvelles de la France et par la citée da la journée «Il ne suffit pas d'avoir un grand esprit, mais le bien l'utiliser. Les élèves de 5e année ont marché la rampe avec des vêtements de créateurs présentant des robes du 17ème siècle et mode moderne par exemple Chanel à Christian Dior etc. Puis ils ont chanté quelques chansons populaires françaises, Suivante les étudiants de 8eme ont présenté une courte pièce de théâtre l'histoire de Jeanne d'Arc. Le spectacle a atteint son apothéose avec la danser sur les airs de la célèbre chanson rap français. 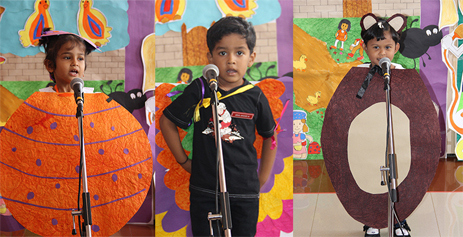 Sanskrit Day was celebrated in a magnificent way on 07 Feb 2013 in our School. 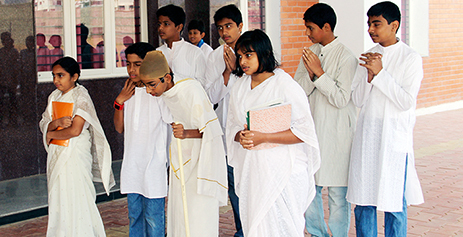 Sanskrit students enthralled the audience by their Vedic Chanting in the beginning of the programme. 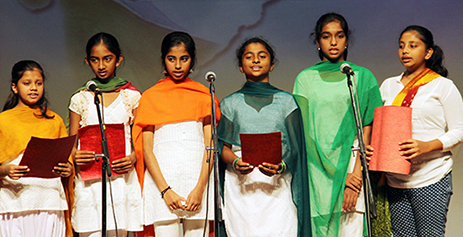 It was followed by a melodies patriotic song by Sanskrit students of grade 6. A speech was given to show the divinity, importance and scientific aspects of the Sanskrit Language by Gaurav Ganapathy a grade 8 student. A skit “Bhookailasa” which is one of the famous mythology was enacted by Grade 8 students which was appreciated by the audience. 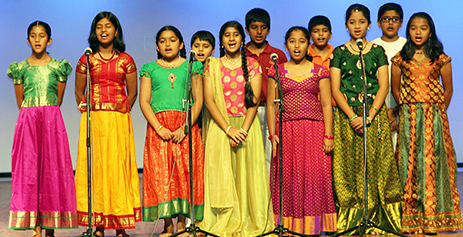 After which students of grade 7 tapped their feet for the song “Gananayakya Ganadevathaya”. The programme was ended thoughtfully by chanting “Eykya Mantra”. Martyr’s Day was celebrated at NPSI, Mysore with the patriotic fervour deserving of these brave souls. Students of grade 8 presented a skit depicting the assassination of Mahatma Gandhi and dedicated a medley of patriotic songs. Two minutes of silence was observed at 11 am to mark respect to the slain leaders and soldiers. NPS International Mysore unfurled the 67th Republic Day with a lot of patriotic zeal and fervour. The programme, which was ably compered by the students of grade 7, began with a beautiful song “Tri Sindhu Teere Triloka Janani” by the students of grade 6. It was followed by remembering our great leaders who have fought for the Independence of our country. A short play of “The Indian Rebellion of 1857” was enacted by our students where the leader of the Sepoy Mutiny, the Great “Mangal Pandey ” reminded us of the great sacrifices made by our freedom fighters. Another great rebellion was enacted by our grade 5 students which depicted the great resistance of “Rani Lakshmi Bai against the British East India Company”. Finally the powerful recitation of “Jaya Bharati Jaya Bharati” by grade 7 students brought out the patriotic feeling in one and all. It was riot of colours at our campus on Saturday,18 January 2014. A tour of the 7 continents by the little students of the Early Learning Group was a mesmerising show. 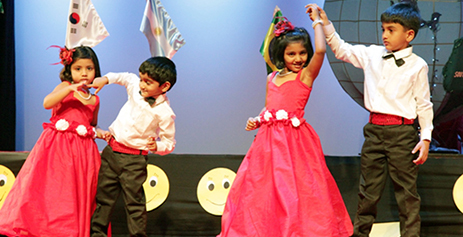 Taking the audience from the southernmost tip of the world Antarctica to Asia and the other continents, the students of Montessori and Kindergarten proved to be an explosive lot. Pitter – pattering feet danced to tunes varying from Waka – Waka to Vengaboys. 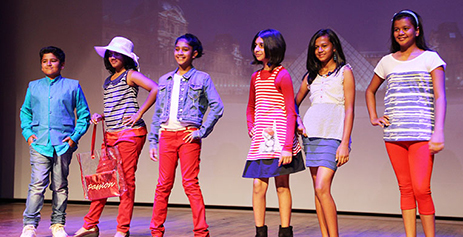 The show ended on a note of hope for World Peace and Harmony with the performers and spectators swaying to “We are the world, we are the Children” sung by the students of grades 2 and 3. It was an evening to remember.........with parents and grandparents leaving the auditorium with wonderful memories of their little ones in their brightly beautiful costumes, oozing confidence on the stage. Truly, the world came alive at Anokha 2014 at NPSI, Mysore! 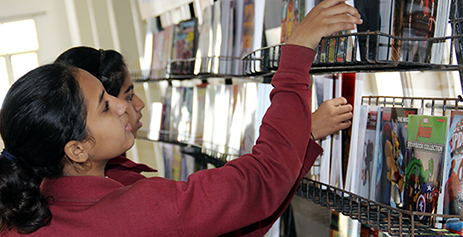 NPSI had its first book exhibition by the Scholastic Publishers on 2, 3 and 4 of January 2014. This was organized in the Sports Hall in the Auditorium Block. All the students were allotted some time to visit the exhibition and pick up books. Parents were also invited to come and special entry pass was made for them. The exhibition had books for all ages in various categories- fiction, non-fiction, biographies, encyclopedias, early learning, picture story books, quiz books etc. The children were also offered small gifts like pens/ bookmarks etc. on big ticket purchases. The teachers were also offered a discount of 15% on all purchases. The scholastic company also conducted competitions for all groups. The winners of these competitions will be getting books sponsored by them. In a bid to nurture the reading habit of children, thispartnership would be a wonderful start and we hope to have wider range of books on display and sale every year on. The spirit of Christmas and flavour of the new year was in the air at NPSI, Mysore. 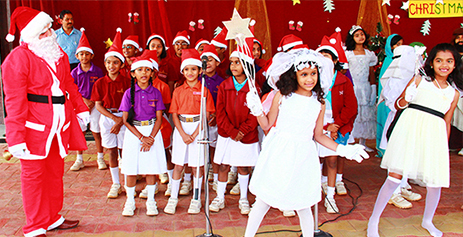 Christmas was celebrated on Friday, 20 December 2013 with great fervour.Students from grades 2 and 3 sang carols and enacted the nativity scene. Santa gave away sweets and cupcakes to the students and faculty members of NPSI. The whole school was decorated in the Christmas theme and truly bore a festive look.